If you liked this video, you may want to have a look at part 2 and part 3. In an earlier video, I explained that one of the greatest misconceptions about mindfulness meditation, a misunderstanding that is one of the main reasons why so many people quit and never develop the benefits of their practice, is this idea that you’re doing it wrong if you can’t still your mind. And, I promised that I’d show you what to do with all those thoughts racing through your mind in a future video. Well, that’s what this video is all about: how to work with thoughts while meditating. The most important thing to keep in mind when working with thoughts is that thoughts are just thoughts. They’re just mental events. They’re not you and they’re not some unquestionable truth. In fact, a lot of the time, they may seem totally random. So treat thoughts as what they are: just mental objects that can be observed. And when you observe thoughts in this way, you’ll notice that they have two parts to them: a payload and a delivery mechanism. The payload is the content of the thought. It could be a memory that you’re rehashing, an argument you’re planning to have, the details of the thing you’re worrying about or obsessing over, and so on. While meditating, you need to be very careful with the payload. 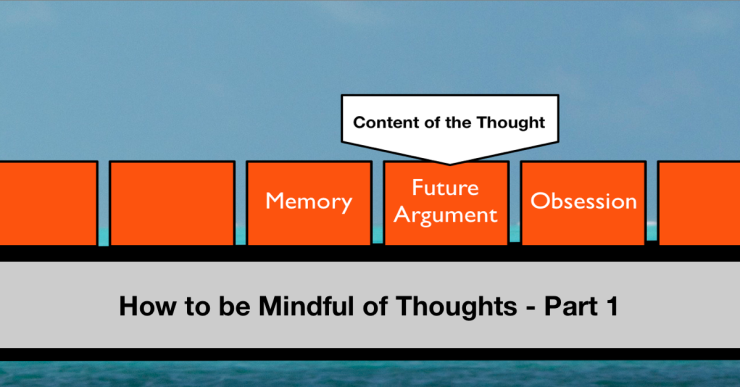 You want to avoid getting sucked-in to the content of your thoughts, because once you do, you’re no longer objectively observing them. Instead you’re totally identified with them and lost in them. For this reason, if you’re a beginner, my advice would be to completely ignore the content of your thoughts while meditating. The delivery mechanism is the form the thought takes in your mind. Is it verbal, is it a picture, is it like a movie playing in your head, is it a kinesthetic sensation, is it some combination of the above? Paying attention to the delivery mechanism of the thoughts in your mind helps you to observe the thoughts without getting captivated by their content. And you’’ll also learn some cool stuff about how thoughts manifest in your mind. So, if you’re a beginner at this, your focus is on just noticing the thoughts. When you become aware of a thought, you mentally label it as “thinking” and then go back to your breath or whatever your focus for your meditation was before you noticed the thought. As a beginner, you’re developing the ability to be aware of thoughts while not getting lost in their content. So, don’t be concerned with what kind of thought it is, or what it’s about. Once you can notice thoughts pretty easily, without getting sucked into their content, can observe them in more detail and can categorize their content or their delivery mechanism, or both. So, for example, when you notice a thought about planning a future argument, you can mentally label it as “planning” or “planning argument”. If you noticed that the thought was verbal you can mentally label it as “talking”. If the thought was a bunch of mental images, you can label it as “images”, and so on. That’s it for this video. I hoped you enjoyed watching it and learned some useful strategies for working with thoughts. 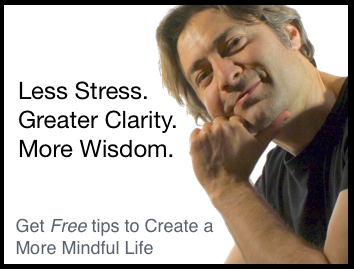 Next week, I’ll show you how to handle thoughts that have a heavy emotional charge, which can make it really difficult to just observe them as mental objects. Make sure you subscribe to my channel, so you don’t miss it. I’m Nick Grabovac, Thanks for watching. Thank you very much Nick. These videos helped. Once I master my awareness skills, I will be able to just observe these thoughts like passing clouds in the sky. I’m so glad you found them helpful Swati! It doesn’t even take mastery – just a bit of consistent, daily practice and you will find it much, much easier to approach thoughts simply as mental objects that can be observed.